With a pedigree going back over ten years, The Definitive Handbook of Business Continuity Management can rightly claim to be a classic guide to business risk management and contingency planning, with a style that makes it accessible to all business managers. Some of the original underlying principles remain the same – but much has changed. This is reflected in this radically updated third edition, with exciting and helpful new content from new and innovative contributors and new case studies bringing the book right up to the minute. ANDREW HILES was founder and Chairman of the first international user group for business continuity and disaster recovery planning; founding Director and first Chairman and Fellow of the Business Continuity Institute; and a founder of the World Food Safety Organisation. He is an acclaimed international presenter on crisis, risk and business continuity management and author of five other books on these topics – this book and others are required reading at many universities around the world. As a Director of Kingswell International, Andrew delivers consultancy, workshops and seminars across Russia, Europe, the Pacific Rim and Australasia, North and South America, the Middle East, India, China and Africa and has presented on radio and television. In 1997 he was presented with the Western Press Award for services to business; in 1999 was nominated for lifetime achievement at the Business Continuity Institute / Corporate Insurance and Risk Awards in London; and in 2004 he was inducted to the BC Hall of Fame by CPM magazine in Washington DC. Andrew recently contributed the BC section to Qatar Finance – The Ultimate Resource and continues to serve his blue chip clients internationally. Introduction to the 3rd Edition (Andrew Hiles). How to Use this Book (Andrew Hiles). Section One Achieving and Maintaining Business Continuity: an executive overview. 1 Enterprise Risk Management (Andrew Hiles). 2 Developing a BCM Strategy in Line with Business Strategy (Gary Hibberd). 3 The Importance of Business Strategy in Business Continuity Planning (Ranjit Kovilinkal Ramakrishnan and Satish Viswanathan). 4 Multilateral Continuity Planning (Dennis C. Hamilton). 5 Marketing Protection: a Justification for Funding of Total Asset Protection Programmes? (Andrew Hiles). 6-1 Operational Risk Management: a Primer (John Robinson). 6-2 Operational Risk Management: Risk and Consequences (Peter Viner). 7 Crisis Management, Emergency Management, BCM, DR: What's the Difference and How do They Fit Together? (Gregg Jacobson and Sue Kerr). 8 Business Continuity and Ethics (John Orlando). Section Two Planning for Business Continuity: A 'how-to' guide. 9 Business Continuity Management Methodology (Malcolm Cornish). 10 Project Initiation and Control (Jayne Howe). 11 Risk Evaluation and Control: Practical Guidelines for Risk Assessment (Ian Charters). 12-1 Business Impact Analysis (Peter Barnes). 12-2 Business Impact Analysis: Building a Better Mousetrap (Andrew Hiles). 13 BC Strategies for Information and Communications Technology. 13-1 Strategies for Continuity and Availability for Information and Communications Technology (ICT) (Michael Smith and Piper-Anna Shields). 13-2 Business Continuity for Telecommunications (Paul F. Kirvan). 13-3 Planning to Recover Your Data: More Options (Thomas Carroll). 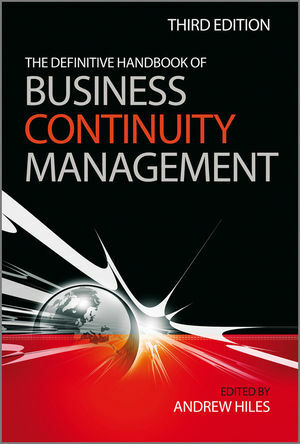 13-4 Business Continuity Strategies for the Business or Work Areas (Neal Courtney). 14 Strategies for Different Market Sectors. 14-1 Business Continuity Strategies for the Financial Sector (Andrew Hiles). 14-2 Business Continuity Strategies for Manufacturing and Logistics (Melvyn Musson). 14-3 Business Continuity and the Supply Chain (Charlie Maclean-Bristol). 14-4 Case Study: Implementing Business Continuity in the Upstream and Midstream Energy Sector (Petrochemicals and Refineries) (Vincent Tombros). 14-5 From an Island to a Continent: Business Continuity in a Telecommunication Company (Timothe Graziani). 14-6 BC Strategies in the Retail Sector (Steve Mellish). 14-7 Strategies for Funding Recovery (Danny Rowland). 15 Developing and Implementing the Written Plan (Andrew Hiles). 16 Awareness and Training (Andrew Hiles). 17-1 BC Plan Testing (Tim Armit). 17-2 Testing vs. Exercising: What's the Difference? (Philip Jan Rothstein). 18 BCM Audit (Rolf von Rössing). Appendix 1 Case Studies (Peter Barnes, Andrew Hiles, Allen Johnson and Lyndon Bird). A1 A Storm, Earthquake, Explosion: a General Overview. A1 C World Trade Center Explosion - February 26, 1993. A1 D Hurricane Andrew, Miami - August 24, 1992. A1 E Chicago Floods - April 13, 1992. A1 F Thirty Seconds of Terror! The California Earthquake. A1 G After the Fire: First Interstate Bank, Los Angeles. A1 H One Meridian Plaza, Philadelphia. A1 I The Mercantile Fire. A1 J How Floods Can Ruin Your Day: London College of Printing. A1 L A Cautionary Tale. A1 M It Happened to Them. A1 O Wessex Regional Health Authority. A1 P The Bishopsgate Bomb - April 25, 1993. A1 Q City Bomb Blast, St Mary Axe - April 10, 1992. A1 U Lessons in Risk Management from the Auckland Power Crisis. A1 V Foot and Mouth: A Preventable Disaster. A1 W The Madrid Rail Bombings - March 11, 2004. A1 X Istanbul Bombings - November 2003. A1 Y London Bombings - July 7, 2005 (7/7). A1 Z Buncefield (UK) Oil Terminal Disaster - December 11, 2005. A1 AA Intellectual Property Theft and Business Continuity. A1 AB Euroclear Bank Uses BCM Framework to Manage the Impact of the Collapse of Lehman Brothers. A1 AC The Toyota Recalls, 2009-2010. A1 AD The Icelandic Volcanic Ash Plume - April 2010. A1 AE The 2010 BP Oil Spill - Gulf of Mexico. Appendix 2 Guidance Notes (Malcolm Cornish, Lyndon Bird, Allen Johnson and Russell Price). A2 B Selecting the Tools to Support the Process. A2 C The Role of Insurance. A2 D Five Nines: Chasing the Chimera? A2 E Consultancy without Tears. A2 F Coping with People in Recovery. A2 G Benchmarking and Business Continuity: Exploring and Using Benchmarking to Assess and Develop Your Business Continuity Management Programme. A2 H Changing Attitudes to Business Continuity in Private and Public Sectors. Appendix 3 Professional Associations, Certification Standards and Resources for BCM Practitioners (Mike Gifford, Lyndon Bird, Dhiraj Lal, Gary Liu, Russell Price and Dawn M. Shiley). Appendix 4 International Perspectives (Paul F. Kirvan, Lyndon Bird, Dhiraj Lal, Louise Theunissen and Andrew Hiles). A4 A International Standards and Legislation in Business Continuity. A4 B Business Continuity Management: International Perspectives in 2010. A4 C Business Continuity Planning in the Middle East and the Indian Subcontinent. A4 D Business Continuity Management in Africa. A4 E Business Continuity in China. Glossary of General Business Continuity Terms.